While I drink my Latte Machiatto and eat my croissant and wait for delegate access to HP Discover 2011 EMEA to open to delegates, I will update any who are following this on our presentation last night of the Vivit Worldwide Champion and Leader of the Year, 2011. What seemed like the largest number of chapter and SIG leaders to gather for dinner yet converged on the upper floor of the 1516 restaurant in downtown Vienna last night. The dinner was for Vivit to have an opportunity to recognise our leaders who keep the machinery of Vivit moving - without them there would be no Vivit Worldwide. 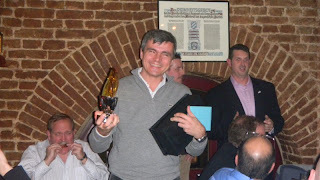 At the dinner we recognised both our EMEA Leader of the Year, and Champion of the Year. The Champion of the Year is a new recognition category this year, decided to begin this fall by your Vivit Directors. We find that as we are an organisation that is accountable to our members, we have always held the policy that HP employees cannot be leaders in our organisation. That long standing and popularly supported by-law has led us to a conundrum however; what happens when an HP employee goes above and beyond in their support for the Vivit Worldwide community and goals? In order to rectify this oversight, we created the category of Vivit Champion of the Year. This year, while receiving a couple of strong nominations, we did eventually make the decision to award this honour to Paolo Cattacolio from HP in France. Paolo has been instrumental this past year in bringing the European user community of the TRIM product into the Vivit family. TRIM was acquired by HP, as a great asset to their software portfolio, but the well-established local user groups of the product were left without a global connecting community to HP Software. This is where Paolo, and Vivit Director Richard Bishop identified a need and worked tirelessly to support these users. 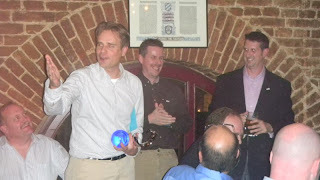 So in recognition of his support of the Vivit user community worldwide, and the TRIM software users need to interconnect globally for advocacy, education, and community, Vivit President Michael Collins and myself (Director of SIGs & Chapters, and co-leader of the BSM SIG) presented the beautiful trophy for EMEA 2011 Vivit Champion of the Year to Paolo. After a rousing round of applause, Michael called attention to the awarding of the Vivit EMEA Leader of the Year. I believe this is the third year for this reward, which has gone to the passionate and thorough work of our German leaders in years past. This time we moved the trophy north in recognition of the efforts this past year, and years previous, of Martijn Stuiver. Martijn is a co-leader of the SM SIG, and has recently integrated existing customer and partner communities in Holland into a Dutch local user group. Michael extended a sincere thanks, and warnings to carry the trophy carefully! Martijn shared with the rout his secret passion for 5-pin bowling, but we aren't sure when he would possibly have the time! We just hope he doesn't use the globe from the trophy! Thank you to both Paolo & Martijn, all the leaders who were present last night, and all our leaders around the world who couldn't join us in Vienna, but whose passionate work for Vivit is noted year round. If you know a great Vivit leader in your local chapter or special interest group, or an HP employee who goes above and beyond to support the HP Software user community, please make sure you let myself or Stephanie know about them, and be certain to nominate them for the next Champion and Leader of the Year.